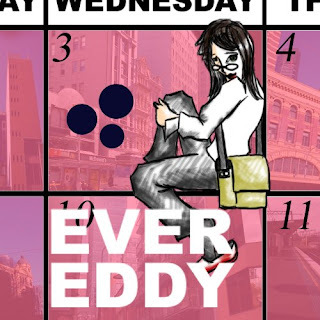 Xscript Fiction: Ever Eddy 1x01 - Blue Berries! NEW (potential) SERIES! Ever Eddy 1x01 - Blue Berries! NEW (potential) SERIES! Edwina Collins is here and she's ready! Boy is she ever ready! Click on to read the whole thing and see what the newest addition to the X-script line up has to offer! It’s five in the morning, and Edwina is dreaming of blueberries. Gary: so I have some forms…? Miranda: you’re a library monkey. You most certainly cannot! Miranda: only one person is allowed to officially sign them and that is head librarian, Edwina who is never here on time, never paying attention and never there when you need her! Gary: a bit of a slacker, eh? Miranda: don’t you DARE talk about your new boss like that! You are a library monkey and she is the member of the team who has been here the longest and she is possibly my oldest friend! Gary: okay…well…if you need her…why don’t you call her? Miranda: the cynical “what” that just came out of your mouth. You don’t believe she has quirks? Miranda: you want to see what happens when I call her? Eddy: I DON’T HAVE BLUEBERRIES! Miranda: I DON’T CARE! We have a book signing today amongst the rest of the absurd crap we have to get done TODAY! Eddy: I don’t think you understand! I. Have. No. Blueberries. Miranda: no I don’t think you understand! I. Have. No. Head. LIBRARIAN! Miranda: no…I know how you THINK it works. But I’m sure that it does not! Eddy: how can you be a skeptic? Miranda: GET TO WORK NOW! Eddy: blueberries! I dreamt about blueberries last night! Miranda: that doesn’t mean anything! Eddy: what about the time I packed dog biscuits and despite neither of us having a dog? Eddy: that dog attacked us and we used the dog biscuits to escape that crazy dog when it attacked us! Miranda: the dog attacked us BECAUSE of the biscuits! Eddy: that bottle of bleach we used to clean up the vomit the kid left in the foyer? Miranda: he threw up because he smelt the cheap chemicals! Eddy: exactly! And when those two men asked us for a light we couldn’t help them! Eddy: so? They were male models! They could have given us their numbers and we could have dated male models! Eddy: page four in today’s paper! Miranda: moment is over! Go get her! Gary: you like the bike? Woman: why are you apologizing? Woman: what can I do for you stranger? Gary: damn right I do! Eddy: hi! I’m Edwina Collins! Gary: cool. Is he here yet? Miranda: he was supposed to be but…! Jon: sorry I’m late! Hope I didn’t keep you waiting! Gary: (to Eddy) you really believe you see the future? Gary: what’s the weirdest item you had to pack? Eddy: come on! We need to set up! Miranda: I can’t believe you’re the boss sometimes…did you even fill out the paper work? Eddy: ugh…how is this going to get worse? Jon: who do I make it out to? Fan: you don’t remember me? Fan: six years ago! Remember? Fan: can I touch your face? Fan: EVERYONE BACK OFF! NONE OF YOU DESERVE TO BE IN HIS PRESENCE! Fan: I SAID. BACK. OFF! Gary: is every day like this? Miranda: YES! VICTORY! Maybe you’ll be on time for work tomorrow! Gary: oh! Before I do go…can you sign this form? Miranda: does that say Community Service? Gary: uh…you…you knew this before hand, right? Eddy: yeah! I have all your paper work! Gary: great! So…can you just sign me off? Eddy: see! Pass me the form! Eddy: what do you think he did? Miranda: I don’t know…but did you see him handling that insane fan? Miranda: what if he’s a violent psychopath? Miranda: didn’t you get sent his paper work? Miranda: okay…psychic…why did you dream about blueberries and not just a pen? Gary: hey! You got plans? So now you’ve read it! Let me know what you think! lol, Nice start to a new series. Well done.